I’ve been away for a few weeks. Not physically, oh no. That costs cabbage. Instead I have just been away from this blog for an incredibly dull reason- the film I watched specifically for this latest post neither blew me away, bored me to the point of mockery nor is weird enough to astound. Although it certainly has all three of these aspects at times. Parts impressed me, parts bored me and the general concept is somewhat weird. So I had to decide whether to write this entry or to abandon it for something else. Then like the protagonist, I decided to ride this scenario out and push onward! So today I give you.. Chocolate! No, wait. Not that one. This one- the one with an ‘e’ on the end. Chocolate is a pretty simple tale that we have all heard a million times before; A Thai gangster’s moll meets Japanese Yakuza boss over a turf war. They fall in love, she falls pregnant. He is forced back to Japan, she gives birth. The baby is a little girl called Zen, and she is born autistic. The mother is disfigured by the Thai mobster and cut off from her Japanese lover. Forced into hiding, the Moll and Zen end up living next to a Taekwondo/Muay Thai kickboxing centre. Zen learns fluent Martial Arts through the superpower of Autism, mixed with watching the real life Thai-action flick, Ong Bak a few times. Zen uses her fighting skills to get money owed to her mother from dodgy folks, so she can buy her mum expensive medicine. But when the Thai gangster finds out, he steps in and it all goes a bit pear-shaped… Oh and Zen likes to eat Candy, hence the title. So like I wrote, clearly this is an age old tale of Thai gangsters, Autism, ladyboys, Taekwondo, the Yakuza and chocolate. In the movies ‘Positive Column’ the action is impressively staged. The physicality is impressive in many martial arts movies seems impressive to myself, possibly because I am a chubby writer with the co-ordination of an octopus in spasm, possibly because I appreciate other people being kicked in the face. But since Chocolate features a young teenage girl as the lead, this just seems all the more outstanding. Honestly, there are a few times throughout Chocolate I felt bad for the henchmen due to their beatings at the hands of this skilled lady. Then I realised they were trying to kill a young girl and I enjoyed their pain. 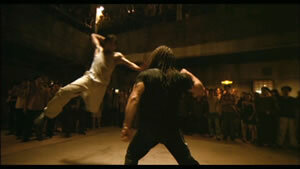 So mission accomplished for having impressive fight scenes, which is clearly a must for any action film. Lead actress JeeJa Yanin really does excel in all of these combat takes, seeming fluid and powerful beyond her years. Tying into the ‘cheering’ of Zen in such fight scenes is the fact that the the core concept is a socially-positive one. Here a child with Special Needs is a heroic figure, albeit a very violent one. She is loving and supportive towards her family and tries to protect them. She is more capable than all the ‘normal’ opponents she comes across. All of which is made clear with the opening title card which dedicates the film to the love of ‘special’ children all over the world. Although this may seem a little cloying in a cynical mindset, it is an undeniably upbeat approach to an action film. Finally, I like the overt references to the successful Thai movie, Ong Bak. Not only does Zen watch Ong-Bak to learn some moves, certain action scenes are presented in ways throughout Chocolate to resemble Ong Bak. For instance, there are impactful fights in Ong-Bak where two characters are filmed with a static camera, on opposite sides of the screen. The hero, played by Tony Jaa, leaps across in slow motion and delivers a powerful, jaw-crunching blow to his opponents head. This is a skull-rattling shot that is hard to forget. Chocolate features this same shot too, although replacing an elbow with a knee in terms of limb-usage and delivered by JeeJa Yanin. Damn man, dude’s about to Ong-Bak’d, yo! Damn man, dude’s about to Ong-Bak’d, yo… Part 2! Of course it is possible that the similar shot is just coincidence. After all, there is a limited amount of ways to shoot two characters fighting. Yet the fact the same Director, Prachya Pinkaew, is responsible for both films. Combined with Zen’s interest in Tony Jaa films implies this is a much more blatant connection. 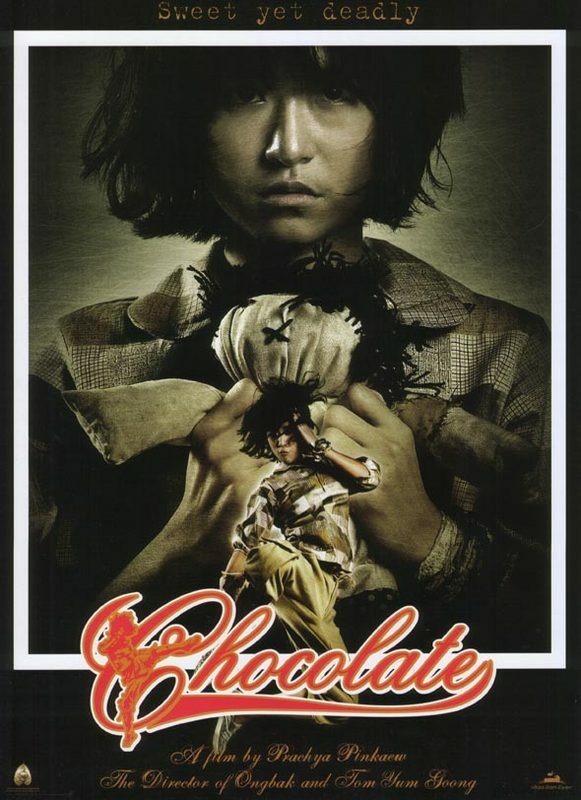 Personally I like this as it gives a wink to Ong-Bak which set the pace for Chocolate’s very existence. Now, into the ‘Negative Column’. For any positive-laced concept of featuring an Autsistic lead, the same case can be made that the film is pure exploitation of the same condition. In one particularly poor taste scene, Zen has to combat her equal, the similarly addled Thomas. In addition to this question of taste, Chocolate also has one larger, more unfortunate aspect from my viewing. Aside from the fight scenes, the whole thing is boring. The acting is poor and the characters two-dimensional. So much so that sitting through any part that did involve high-ocataine action was a chore. Better known Marital Arts films such as The Raid show that stripped down characters can be fine if the film is so streamlined as to be one giant set piece. Whereas in the opposite manner, something like the afore-mentioned Ong Bak focuses on the protagonists Buddhist nature to present a conflicted hero. 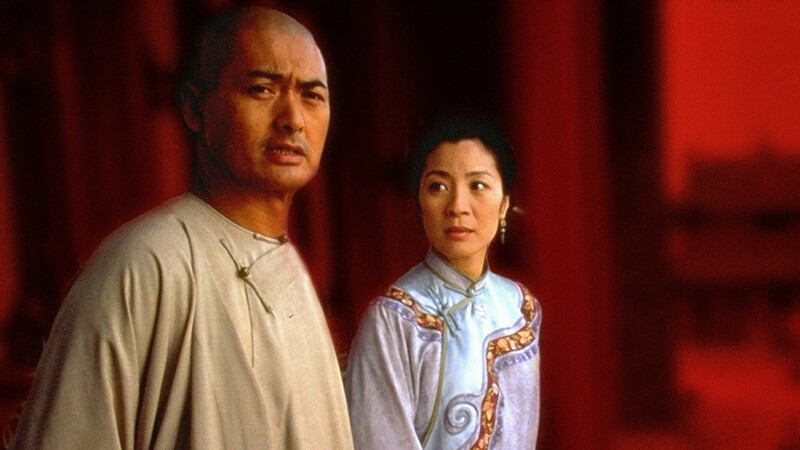 Or even Crouching Tiger, Hidden Dragon which spends a lot of time developing the inter-personal politics of its cast, and thus in turn enriching them all with more fleshed out parts that are played by solid leads. These are just three examples off the top of my head, but they already show that Martial Arts films from recent years can work in different ways. They can be stripped down, spiritual or more lingering. Chocolate though is somewhere in the middle of all these. It is not as simple as The Raid, nor as focused on its core concept as Ong-Bak, nor as developed as Crouching Tiger, Hidden Dragon. Chocolate is indeed its own movie, so comparisons to different types of martial Arts films from other film makers in other countries and years are of course in some ways unfair. But the more soap-opera like performances that seemed to drag out the non-action scenes distracted from Chocolate’s potential so severely they need mentioning. Action + Soap Opera = Wrestling! If it had been as stripped down, centrally-focused or downright as rich as the above comparisons then Chocolate could have been a more satisfying movie. More so, it may have made more of its unique conceit and spread its message a little bit more powerfully. Zen is an interesting character portrayed by an excellent athlete. Yet if only the movie had been better on the whole, perhaps more people may know about Chocolate without mistaking it for the Johnny Depp-Juliette Binoche film, Chocolat. Next time something new. A challenge if you will.